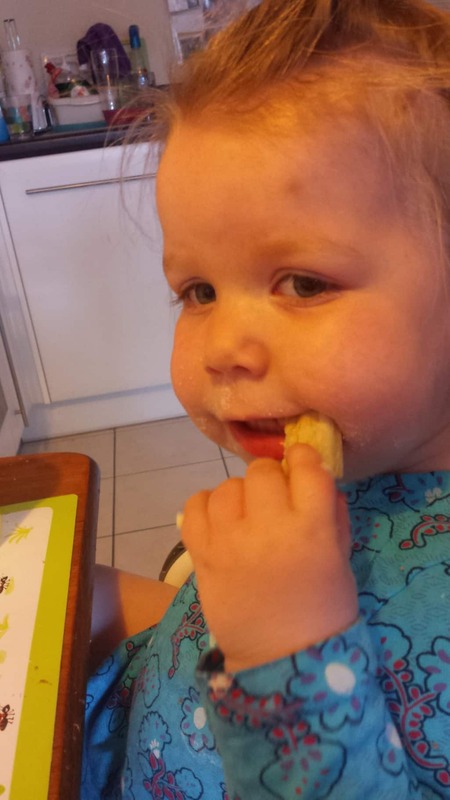 What my toddler eats… and a plea for help! We’re having some food related issues at the moment, partly Athena being fussy and partly me being uninspired and not knowing what I can cook/prepare to encourage her to try new things that she might like! She has a good appetite but only for certain things, and she has a really sweet tooth! I freely admit to using packaged microwave meals for toddlers every so often over the last few months when I was too tired and pregnant to cook something ‘proper’ for her, but now I am not I want to stop using them and attempt to have all of us eating the same thing each night as much as possible! 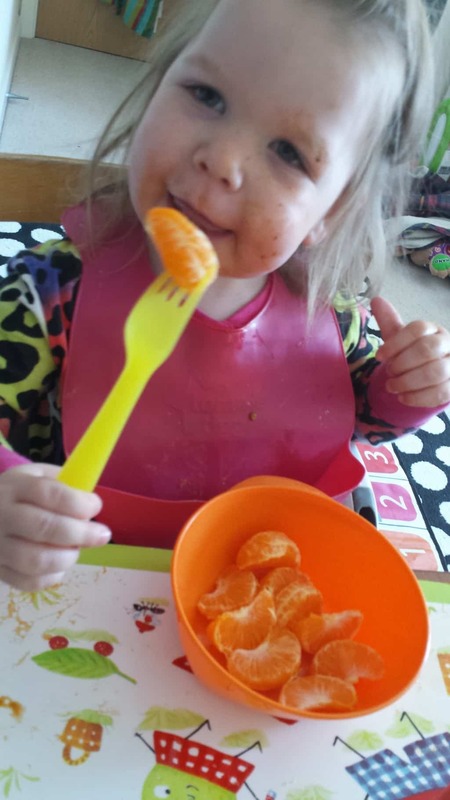 Things she happily eats: Chips, waffles, toast, crumpets, yoghurt’s, breadsticks, scotch eggs/sausage rolls, baked beans, chicken nuggets, rice, chilli con carne, noodles, raisins, banana chips… and probably other things that I can’t think of right now! I have to hide veg chopped up really small in sauces and hope she doesn’t notice them! What I’d love to do is start making healthy meals and snacks, like savoury muffins and biscuits etc so I have bit more control over what she’s consuming! Clearly she’s not lacking in appetite and lets face it, she’s got rolls in all the right places so she’s definitely consuming enough food, I just wish it was a little healthier! It’s vegetables that seem to be the problem, and even some fruit. She has a love hate relationship with Bananas, won’t eat apples fresh but loves grapes and satsumas. 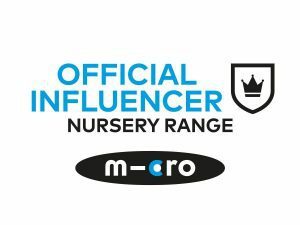 Organix recently sent us some some of their new fruit bars to try out, and they go down a treat and are now kept in the changing bag for a healthy distraction snack when we’re out and about (especially handy for when I need to change Arlo’s nappy!) and the Apple & Date is a particular favourite considering she wont eat a fresh apple! So any ideas/recipes/posts you’ve got that you can fling in my direction to help hopefully cure my slightly fussy eater would be much appreciated! Also yes, she is eating a satsuma with a fork, who knows why? I haven’t really got any tips but I really wouldn’t worry about it. If she only likes grapes and satsumas then just give her grapes and satsumas! Elsa went through a phase where she wouldn’t touch ANY veg so I just switched it for cucumber and fruit instead for a few months until she started showing an interest in veg again. Now she eats it fine. I would really recommend cooking together as a way to get kids to eat, my son has always eaten anything (except stews, aka ‘slop’), but my daughter has been quite fussy from the get-go. She is so much more open to trying things she’s made. I love mydaddycooks.com as he has videos of him and his kids cooking at levels I wouldn’t have tried until I saw what was possible with a small child (although I still get a lot more flustered with spills and egg shell disasters than Nick does on the site). We also get cooking books out of the library and I will let her choose a meal to make together (or one dinner and one pudding, as she would always choose pudding), we had lots of fun with Top Bananas by Mumsnet, as it had plenty of pictures in. Again the MyDaddyCooks book was good too.